Finally, it is official: it was announced on Tuesday that the Supreme Court had determined that some clauses of the proposed 20th Amendment to the Constitution were deemed inconsistent with the Constitution and therefore required approval by a two thirds majority in Parliament as well as a referendum. The extremely politically significant announcement, already much speculated upon by the media, was made by Speaker Karu Jayasuriya on Tuesday in Parliament. It was significant because the proposed amendment included provisions to hold elections for all provincial councils on the same day- and thereby would have provided an opportunity for the government to defer polls that are due shortly. Had the proposed 20th Amendment been approved by the Supreme Court, it would have included a transient provision that empowered Parliament to dissolve all provincial councils on a specified date. Such a date was not to be later than the expiration of the term of the provincial council that was the last to be elected. Therefore, it would have been possible to defer provincial polls for quite some time. Now, however, that is not possible. This is because even if the government was able to muster a two thirds majority in Parliament, it would not pursue a referendum on the matter. As a result, elections to at least three provincial councils are imminent. The Sabaragamuwa, Eastern and North Central Provincial Councils fall vacant on September 26, September 30 and October 1 respectively. It must be noted that Local Government elections are already overdue. 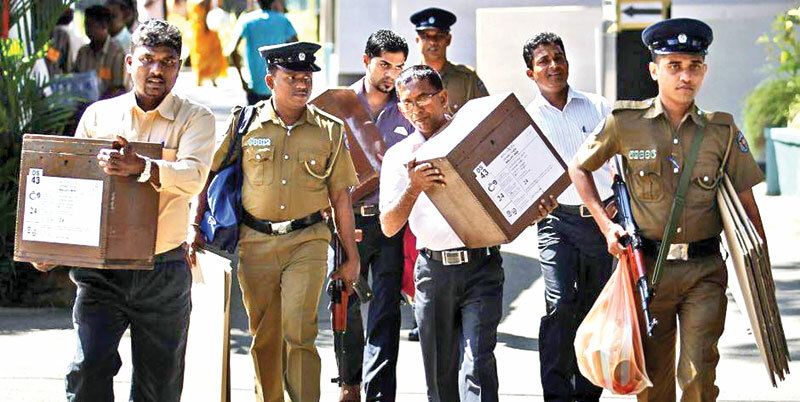 However, they will not be held this year, former Elections Commissioner and now Chairman of the Elections Commission Mahinda Deshapriya has announced. “The elections cannot be held in December this year because of the Ordinary Level examination. The Commissioner of Examinations has requested not to hold elections on the available date of December 9, 2017. It is not possible to hold elections at the end of the year because state institutions carry out their audits at that time. The only other available date would be mid-January but polls cannot be held then because of Thai Pongal. Therefore the next available date would be January 20 next year”, Deshapriya explained. Deshapriya also said that the Elections Commission would issue notice declaring elections to the Sabaragamuwa, Eastern and North Central Provincial Councils on October 2, 2017 if the proposed 20th Amendment is not passed by Parliament. However, he could only speculate on the date of elections for these councils. “If the election is declared in October it has to be held in December 6 this year. However the views of the Commissioner of Examinations will have to be sought as the Ordinary Level exam will also be held around that time”, he said. Speaking in Parliament on Monday, Prime Minister Ranil Wickremesinghe declared that all polls would be best held next year, because of the Ordinary Level examination and the upcoming Budget. Former President and now Kurunegala District parliamentarian Mahinda Rajapaksa in a rare interjection then asked the Prime Minister when provincial polls would be held. Wickremesinghe pointed out that the Ordinary Level examination would create problems for any election in December and stated that this could be decided in consultations between political parties and the Elections Commission. There is so much interest in provincial polls because all provincial councils with the exception of the Northern Provincial Council are presently controlled by the United Peoples’ Freedom Alliance (UPFA). That is because, during the Rajapaksa years, Provincial Council elections were staggered and held, a few councils at a time, so the incumbent government could gain maximum political advantage. It also meant that the vast majority of sitting UPFA members in these councils were ardent Rajapaksa loyalists. The political landscape has seen a sea change since then. The United National Party (UNP) partly holds the reins of government. The leadership of the Sri Lanka Freedom Party (SLFP), the dominant partner in the UPFA is now with President Maithripala Sirisena and Rajapaksa now sits in the Opposition. There is much interest in the fact that provincial elections would pit the two major partners of the National Unity Government, the UNP and the SLFP, against each other- and whether they would survive such a contest. However, it must be noted that have already had such a duel in a far more contentious poll- the August 2015 general election- and emerged relatively unscathed. What would be more interesting is the contest within the SLFP. At the August 2015 general election, although there was an obvious tug-of-war between the mainstream SLFP led by President Sirisena and the dissident faction loyal to Mahinda Rajapaksa, the party still contested as one entity. Instrumental in that exercise were general secretaries of the UPFA and SLFP, Susil Premajayantha and Anura Priyadarshana Yapa. It was an unenviable task for Premajayantha and Yapa, who were appointed to their posts by Rajapaksa. It was well known that President Sirisena was unhappy with the fact that the UPFA nomination lists accommodated many Rajapaksa loyalists. That is why, after the election, he purged the SLFP National List of Rajapaksa loyalists and appointed his nominees to Parliament. Soon after the election, Premajayantha and Yapa were also replaced by Mahinda Amaraweera and Duminda Dissanayake. There were indeed attempts being made by several individuals in the SLFP to try and again forge a common front for the Provincial and Local Government elections. These moves appear to have yielded no results and the sacking of Deputy Minister Arundika Fernando is evidence of that. Fernando had been publicly critical of the government and stated that he would vote against the government on the proposed 20th Amendment. It was also known that he was in discussions with the Joint Opposition (JO) group; hence his sacking by President Sirisena. In Parliament on Tuesday, Fernando crossed over to the Opposition benches after making a special statement. In his speech, Fernando expressed his disillusionment with the government which he claimed was not keeping its promises and declared that he would fight until he brought the government down. Previously, there had been speculation that there were many more parliamentarians who were planning to cross over from the mainstream SLFP to the opposition, but if that was the case they appear to have got cold feet. If anything, Fernando’s cross-over suggests that the positions of the two factions have now hardened and any rapprochement is unlikely in the near future. As such, this paves the way for a three way tussle- between the UNP, the mainstream SLFP and the JO faction- or a four way contest, if the Janatha Vimukthi Peramuna (JVP) is factored in. This will matter little in the Eastern Province where the Tamil National Alliance (TNA) and the Sri Lanka Muslim Congress (SLMC) have considerable clout. Nevertheless, it will be an acid test for all parties in the Sabaragamuwa and North Central provinces. The Sabaragamuwa province is considered a stronghold of the JO where stalwarts such as Pavithra Wanniarachchi have their vote base. However, if the grassroots SLFP vote is split between the mainstream party and the JO, it is the UNP which will stand to gain. The North Central Province will also be watched closely because the Polonnaruwa district is the home base of President Sirisena while the SLFP’s General Secretary Duminda Dissanayake sees the Anuradhapura district as his stronghold- and they wouldn’t want to come off second best on their home turf. What is noteworthy is also that the government is working on legislation to change the system of elections, changing it from one with total Proportional Representation (PR) to a hybrid between the PR and first-past-the-post systems on a 40: 60 ratio. Obviously, the party which emerges as the party with the most votes will benefit more from this arrangement, but it will still ensure adequate representation for all parties. Thus, while the 20th Amendment has now become a virtual non-starter, at least in the form it was originally envisaged, this will lead the country into a season of elections, a few provincial councils at a time, which will energise the opposition but also provide the government with a timely wake-up call.